There are 9 posts tagged jan lokpal bill (this is page 2 of 2). As you know, Dandi March II walk was held in Bangalore on 26 March 2011 in support of the Jan Lokpal Bill. Over 400 people walked over a distance of 11 km under 4 hours. To my surprise, many people walked the full distance, completely overcoming the physical boundaries. After the march, I asked a few of them to detail how / what it was like while they walked? What did they feel? Anything which they wanted to share. I have got replies from a few of them and I am sharing them below. At least for me, It was first time experience of participating in any such event. And really felt the best way to start the weekend despite little pain in the legs. Honestly speaking, I was expecting little more younger people there considering the number of people from middle or above aged participated. When I heard about this Dandi March 2, like every other person, I also felt how it is going to help ? And once we finished it, it felt we achieved a lot. One thing is for sure, it was never to blame the government or bring down the government. We are well aware such things can’t happen. But it was a great way to show the awareness. At least we made our political leaders realize the mood and understanding of the common man. This is the best thing we could have ever achieved through this Dandi march. 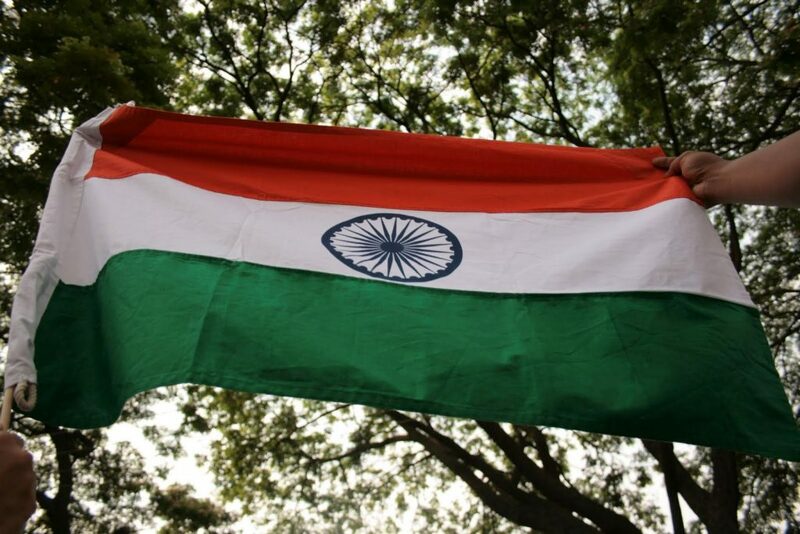 I don’t remember, how many times I have used this Vande Matram and Bharat Mata ki Jai once I finished my schooling. Probably never. Probably we are loosing all these things. Feels like as if these thing are only for school children. We need to have more and more such events to keep it alive within us. I have been to many government offices including police stations. At almost all places I was asked bribe, either directly or indirectly. 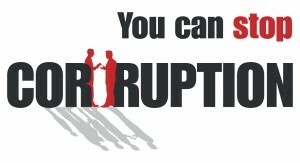 Corruption is quite deep rooted in our society. The biggest issue is that we as a society have learned to live with it. This should change. We are entitled to corruption free governance. When there was a call to be part of peaceful Dandi March in Bangalore in Saturday 26th march, 2011, I decided to participate. It was quite interesting to see a couple of foreigners there too. It was quite a spiritual experience for myself. While being in that march, I kept asking myself about what I expect to change in India and why and how my being here can help to bring about this change. People like shop owners, passers by, small vendors etc were quite curious to see such peaceful march against corruption. Since they do suffer because of it, the pamphlets given to them by volunteers were keenly taken and immediately read. When evil thinks that it can go on forever then there comes a time when good has to rise and defeat it. It has been happening since the beginning and it will happen again. Do we think one day the sky will open and the clouds will part to drop a messiah who will fix our problems? While we are Facebooking and retweeting, the corrupt cash registers are ringing and people are selling the country to the dogs and if we don’t sit up and do something as a group, there will be a day when some power hungry corrupt official will snuff us out. One by one. Do you think your blood will boil then? I went to the Dandi March organised in Bangalore and there were at a point maximum 400 people in it. 400? I am not taking anything away from the fact that there were honest people out there in the sun, trying to make themselves heard but seriously.. 400 is not a number which will dent. And a dent is not enough. Do you want to join those 400 and make it 40000 or are you one of those who will just click on the *Like* button or perhaps *Share* and believe that it is contribution enough? The choice, my dear friends, is ours and frankly, so is the consequence. Maybe I was also a regular guy who had never participated in a rally before. Trust me, it may feel a little awkward at first, but when I cried Vande Mataram with 400 other Indians, it did something good to me. Just participate for that feeling. You will get addicted for life. Update on 18 Oct – I have tried to answer some commonly asked questions about this movement, and also written about what all it will take to become an Anna Hazare.. I thought it right to write a post describing what Jan Lokpal Bill is and why is it needed. To give a brief history, Lokpal Bill was first introduced in parliament in 1968. It has been brought in parliament on eight times on later occasions, but has never been passed by the parliament. It is a bill that is supposed to give powers to citizens to sue the people responsible for corruption. A similar kind of independent agency disappeared corruption from Hong Kong a few decades ago. The government is again thinking of introducing a Lokpal Bill in parliament this year, and the National Advisory Council (NAC) chaired by Sonia Gandhi is considering it. But as it stands today, the bill is riddled with loopholes, defeating its very purpose. Social activists have remarked it to be a toothless bill and not at all acceptable. An alternative bill, the Jan Lokpal Bill has been drafted by Justice Santosh Hegde (Lokayukta of Karnataka), Prashant Bhushan and Arvind Kejriwal after series of consultations with public and social activists. This bill is supported by Kiran Bedi, Shanti Bhushan, Anna Hazare, etc. The Dandi March 2 event and the subsequent ‘fast unto death’ by Anna Hazare from April 5 and Aug 16 were in support of this ‘Jan Lokpal Bill’. The activists have already sent the bill to the PM and all CMs but there has been no response. After the ‘fast unto death’ was announced by Anna Hazare, he was invited for talks by the PM, but the response was bad as the PM said the government has no time for corruption till May 13. This after the numerous corruption scams like the Commonwealth Games, Adarsh Society, 2G scam being uncovered in the past months. The Anti Corruption Branch and CBI comes under the government. Despite having evidence, it is very difficult to convict people as they have to take permission from the same bosses, against whom the case has to be investigated. The functioning of CBI and vigilance departments is secret and hence it promotes corruption. Weak and corrupt people are appointed as heads of these institutions by the government. An institution called LOKPAL in the centre and LOKAYUKTA in each state will be set up. These institutions will completely independent of the governments, just like the Supreme Court and the Election Commission. No minister can influence their investigations. 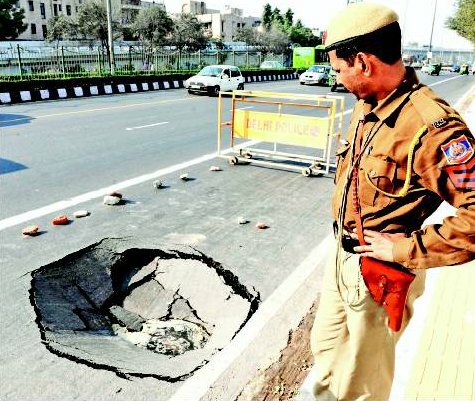 Investigation in any case will have to be completed in one year. Trial should be completed in next one year so that the corrupt officer, or politician goes to jail in two years max. If any work of any citizen is not done in prescribed time in any government office, Lokpal will impose financial penalty on guilty officers, which will be given as compensation to the complainant. So, you could approach Lokpal if your ration card or passport or voter card is not being made or if police is not registering your case or any other work is not being done in prescribed time. Lokpal will have to get it done in a month’s time. Election of Lokpal officials – What if government appoint corrupt and weak people as Lokpal members? That won’t be possible because its members will be selected by judges, citizens and constitutional authorities and not by politicians, through a completely transparent and participatory process. For all those who can recall their history lessons in school, Dandi March was a 24 day, 240 mile (390 km) march to produce salt without paying the tax. It is also known as Salt Satyagraha, led by Gandhi from his Sabarmati Ashram to the sea coast near Dandi. 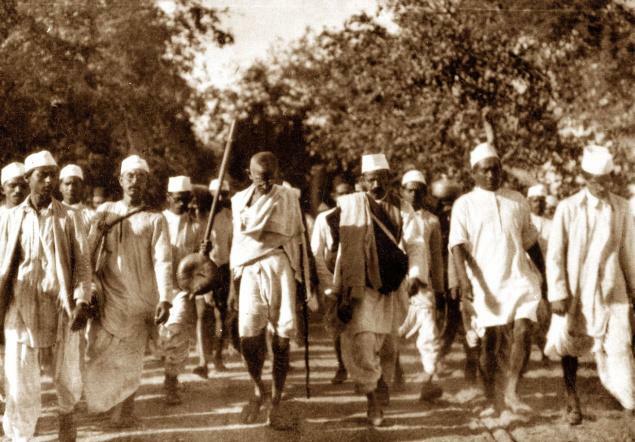 Dandi March was a very important part of the Indian Independence Movement. It was a non-violent protest against the British monopoly of salt in India, and it triggered the Civil Disobedience Movement later. It was done from 12 March to April 6, 1930. Now, 81 years have passed as I write this today on 11 March 2011. We have been independent for over 63 years now, and economically independent for 20 years (since the 1991 economic reforms). But we are still not free socially. We are still not the India that Gandhiji dreamt of. An India without poverty and hunger, an India where everybody has equal opportunity to lead the kind of lives they want. 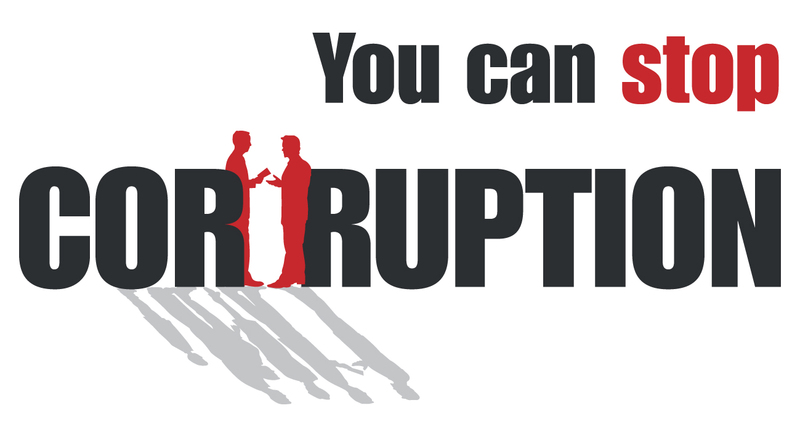 We are still not free from corruption, which is one of the most menacing problems India faces in the 21st century. The Adarsh Society scam, Commonwealth Games scam and the 2G scam have rocked the nation in the recent months, causing the loss of over 60 billion dollars. Dandi March 2 is a march organized by a group of NRIs living in the United States of America inspired by the original march by Gandhiji. It is a 240 mile walk in the US against corruption in India from 12 March to 26 March 2011. 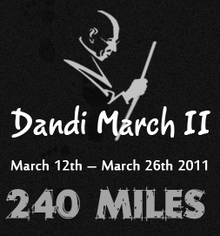 Starting at Martin Luther King Jr. Memorial Park, San Diego, California March 12, “Dandi March II” goes through Los Angeles and ends March 26 at Gandhi Statue, San Francisco. The dates coincide with the dates Gandhi did his historic march in 1930. Every major city in US, 10 cities in India and 8 other countries are organizing support events on 26 March to extend their support for the full 240 mile walk in US. The agenda is to push the government to enact Jan Lokpal Bill which is drafted to free India from the clutches of corruption by social activists like Kiran Bedi, Anna Hazare, Arvind Kejriwal, etc. The support events on 26 March are being organized in cities like Bangalore, Coimbatore, Hyderabad, Chennai, Kakinada, Kolkata, Nagpur, Mumbai, Varanasi and Ahmedabad. In the US, Indians are walking in Atlanta, Boston, Chicago, Dallas, Detroit, Houston, New Jersey, Washington DC and Seattle, apart from the main march from San Diego to San Francisco. Internationally, support marches are happening in London, Singapore, Finland, Germany, etc. More information about the event can be found at http://www.dandimarch2.org. The route details for the full march can be found here and all the event details for different cities can be found here. The facebook page for the march is http://www.facebook.com/DandiMarch2?sk=info where you can find all the important information about the march. The Bangalore support march on 26 March can be seen at http://www.facebook.com/event.php?eid=194657080556635 Accept the event invite to do your bit for a corruption free India. We are walking around 15 kms in Bangalore, join us for 1km, 2km, 5km or whatever is comfortable to you.